Not that long ago I was visiting Bev’s place, My Reader’s Block, reading one of her reviews, in which she was also hosting a giveaway for said book. The review was fantastic, as only Bev can write, so I entered and to my surprise, I received an email, I had won. If that wasn’t enough…..I then received another email. This time from the author asking if I would like to be part of her blog tour. This is such an honor for me to think that a little over a year ago, I didn’t even know blogs existed and now, authors are emailing me and asking to spend some time with us. WooHoo!!! The answer is a definite YES!!! So today, my guest is, and I ask you to please help me welcome her to CMash, Ms. Olivia deBelle Byrd !! Olivia deBelle Byrd was born and bred in the South. She is a graduate of Birmingham-Southern College and a Kappa Delta. She resides in Panama City, Florida, with her husband, Tommy, and is the proud mother of Tommy Jr. and Elizabeth. What began as the quest of a husband to keep his wife quiet segued into a collection of Southern stories assembled as a Christmas gift for my children. Thirty-one months and fourteen rejection letters later, Miss Hildreth Wore Brown—Anecdotes of a Southern Belle was published by an independent New York publisher. Thus was the beginning of Miss Hildreth—a humorous, satirical romp through my Southern life. I like to call it real-life fiction as all the people, places and events are real, but like all good Southern stories exaggeration and embellishment have been added to these real events. Because they are actual occurrences, the reader is drawn into the warmth and familiarity of the characters and their stories. What Southern mother has not threatened her offspring with grits and water for supper if that thank you note does not get written? What quaint Southern town does not have a grand dame who wears turbans and dark sunglasses and calls everyone “dahling” whether they are darling or not? Where else but the South can a mink be mistaken for possum? Being raised by a Southern father and grandmother of great wit, humor flowed as freely as water from a faucet in our household. More years into adulthood then I am going to reveal, when prodded by my husband’s bid to shush me I put pen to paper and the stories poured forth as though an age-old tap had been discovered and turned on. With hours of sweat, spoonfuls of tenacity, and several strokes of plain good fortune, the amusement and idiosyncrasies that are so unique to the Deep South came to life on the pages of Miss Hildreth Wore Brown. The stories are punctuated with everyday mishaps that Southerners seem to have a knack for turning into entertainment. It turns out Bostonians do not always appreciate being called “ma’am” and New Yorkers can have Southern manners. My humorous foray through Southern life has led me into a joyous romp through the land of authors and readers. As an old reader and a new writer, it warms the cockles of my Southern heart to know there are so many book lovers in this world. Through books, we become what we dream, we are educated and inspired, we travel into the souls of characters and find ourselves. To be a new author in the presence of so many creative minds has been a gift. To be in the presence of so many lovers and readers of books has been an inspiration. I believe deeply in the written word. Very simply, it gives meaning and beauty to life. 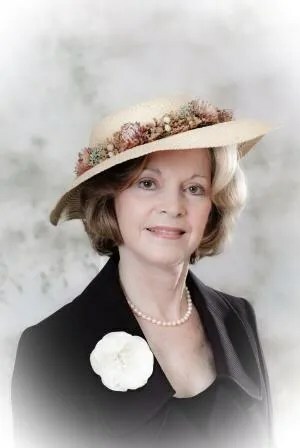 for the umpteenth time, her long-suffering husband looked at her with glazed over eyes and said, “Why don’t you write this stuff down?” Thus was born Miss Hildreth Wore Brown—Anecdotes of a Southern Belle. If the genesis for a book is to shut your wife up, I guess that’s as good as any. TO WIN A SIGNED COPY OF HER BOOK. Great post! I think the book is wonderful with such an in-depth view.